Two of three parachutes malfunctioned in the test flight of a prototype moon rocket earlier this week, causing major damage to the booster, NASA said Friday. The problem caused the Ares I-X booster to slam into the Atlantic Ocean harder than expected. The booster was badly dented by the impact. Mission manager Bob Ess said Friday the damage is irrelevant because the booster is not meant to fly again. The parachute trouble does not detract from the overall success of Wednesday’s flight, he said. All three parachutes on the first-stage booster opened following the two-minute flight. One quickly deflated. Another deployed only part way. The booster, in essence, was brought down by the equivalent of 1 1/2 parachutes. Ess said the parachute lines may be to blame, but engineers won’t know for sure until the parts are inspected early next week. The recovered booster arrived back at port Friday. The $445 million flight test was the first step in NASA’s effort to return astronauts to the moon. 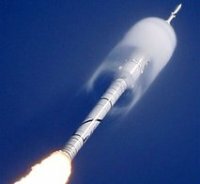 The White House may change direction, however, and scrap the Ares I in favor of other rockets and destinations. Initial indications are that the rocket was “rock solid” during liftoff, with no worrisome shaking from all the thrust, Ess said. There was concern a year ago, among some, that the launch vibrations could be violent. The definitive word, Ess said, will come once engineers get the data recorder back and conduct weeks of analysis.